Keep Your Employees Hydrated This Summer With Our New “Water You Waiting For?” Challenge! 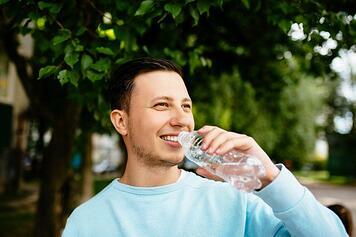 A commonly overlooked aspect of employee health is hydration. While it might not sound as important as nutrition and exercise, staying well hydrated is critical to overall health and wellbeing. And unfortunately, research suggests that 75% of Americans may suffer from chronic dehydration. This means that many of your employees likely aren’t drinking as much water as they should – and your team can’t perform their best when they’re dehydrated. In fact, just a 2% loss of water levels in the body can lead to a 20% decrease in mental and physical performance. This loss of water can negatively affect memory, energy levels, and other essential cognitive functions. Not only is dehydration a danger to productivity and work performance, but it’s also a danger to your employees’ health. Dehydration can result in headaches, dizziness, irritability, and much more. That’s why it’s important for employers to encourage employees to drink more water at work. And what better way to do so than with a new wellness challenge?! Certificate of achievement, tracker, and more! The good news is that drinking more water can easily reverse most of these symptoms! We know that drinking eight cups of water can be a bit challenging while you’re at work. It can be difficult to remember to reach for water regularly when you’re dealing with a heavy workload. Below are a few simple ways to help you drink more water throughout the day – even when you’re busy at work! What Happens to Your Body When You Quit Soda and Focus on Water? The Water You Waiting For? Challenge campaign toolkit also includes some promotional materials and a water log to help encourage employee participation and get employees excited about the challenge. Download your free copy of the toolkit here and help your employees stay hydrated and healthy this summer! Are you going to try this wellness challenge at your office? Let us know in the comment section below!